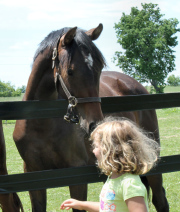 Sally is a charmer – sweet and easy. 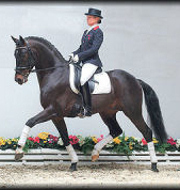 She is by the exciting dressage stallion Sagnol (Sandro Hit / Landadel) – pictured below – from a Furioso II -line mare, so she receives beauty, rideability and athleticism from both her sire and dam. 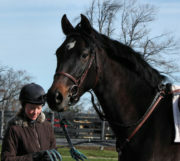 She is a leggy, modern type with a beautiful head, 3 good gaits and an easy temperament. Sally is registered German Oldenburg Verband (GOV), and was awarded a “Premium” at her inspection, praised for her good frame, feminine type, good foundation and correct movement. 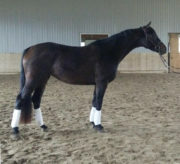 With her light-footed gaits, Sally promises to be a balletic partner for her future owner. 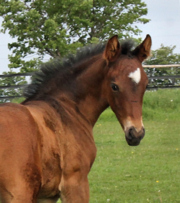 Sally was introduced to training-barn routine, lunging etc in June 2016, and was backed mid October. She is going basic W-T-C, working indoors or outside, alone or in company. 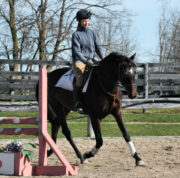 She has been introduced to jumping – and quite likes it. 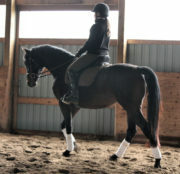 Her trainer says she learns quickly, and is a pleasure to ride, forward and willing.